December begins with the three great benefics, the Moon, Jupiter and Venus, converging together in late degrees of Sagittarius during the twilight hours. Under the influence of Uttara Ashada, this luminous combination inspires openness, grace and ease. You may remember this nakshatra's influence over last month's presidential election, giving unchallengable victory to President-elect Obama. Uttara Ashada is ruled by the ten Vishvadevas or Universal Gods: Goodness, Truth, Willpower, Skill, Time, Desire, Firmness, Ancestors, Brightness and Peak. These deities are the guardians of all that is good and their strength is based on the collective alliance of good virtue. When the Moon, Jupiter and Venus align under their universal consciousness, victory is given to the collective good and we realize that we are more powerful united as one. It is fascinating that President-elect Obama will official announce his national security team, including Hillary Clinton as Secretary of State, under this powerful stellar line up that falls in the 11th house of gains and groups of the US Scorpionic Chart. On December 9, 2008 Jupiter changes sign from its mulatrikona rulership in Sagittarius to its debilitation in the sign of Capricorn. Jupiter's expansive and optimistic nature is subdued under the influence of Saturn's sign. It will be a year to reassess how we spend our money, time and energy. Many of us will be on a debt diet to restore our financial health. It will not be easy, but certainly will be worth it in the long run. In addition, Jupiter will be entangled in the eclipse patterns at the end of January and beginning of February. The solar eclipse occurs on January 25, 2009, followed by a lunar eclipse on February 9, 2009 and Jupiter's conjunction with Rahu on February 14, 2009. Astrological traditions view eclipse cycles as karmic time periods in which the obscuration of the luminaries brings out psychological disturbances, political unrest, shadow issues, and fear. During this two period it is important to remain objective and not get carried away with any impulsive choices based on fear. The sign of Capricorn promises prosperity through sacrifice and endurance. It can bring depression by delaying things, obstacles, and worry, but it can also deliver success through perseverance. I began this blog a few years ago to post my thoughts and interpretations of astrological and astronomical events. My perspective is based on the alchemical principle of 'as above, so below.' As an acupuncturist I am trained to look at patterns to uncover how the macrocosm is reflected in the microcosm. As a Vedic astrologer I have come to realize that the planets and stars are living beings that transmit information to those who know how to listen. The ancient seers and mystics could hear their messages and developed practices like yoga, meditation, and Astrology (in Sanskrit Jyotisha means the 'science of light') to help us find union with the cosmos. The language of the stars is one of light and sound that steps down to human consciousness in the form of symbols and archetypes. The intention of this blog to to simply share what the stars have to say. I have two sisters sites. Starsyncs (click here) demonstrates how some of the astrological aspects that I discuss in starworlds show up in the news and media. Taoworlds (click here) examines the path of healing, both for patient and practitioner, from an alchemical perspective which is the root of Chinese medicine. Unchallengable Victory to Barack Obama!! Lord Ganesha represents the power of the Supreme Being that removes obstacles and ensures success in human endeavors. For this reason, Hindus worship Ganesha first before beginning any religious, spiritual or worldly activity. 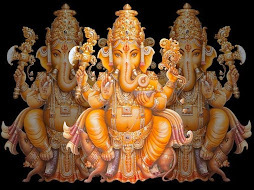 Lord Ganesha is also the protector of travellers, healers, and astrologers. Lord Shiva represents the aspect of the Supreme Being that continuously dissolves to recreate in the cyclic process of creation, preservation, dissolution and recreation of the universe. Saraswati is the Goddess of leaming, knowledge, and wisdom. The Sanskrit word sara means "essence" and swa means "self." Thus Saraswati means "the essence of the self." Saraswati is represented in Hindu mythology as the divine consort of Lord Brahma, the Creator of the universe. Since knowledge is necessary for creation, Saraswati symbolizes the creative power of Brahma. Goddess Saraswati is worshipped by all persons interested in knowledge, especially students, teachers, scholars, and scientists. Twenty-three is my quick answer to the question: "what is the difference between Vedic Astrology and Western astrology?" I don't mean to be cryptic, but 23 degrees is literally the difference between the Tropical and Sidereal zodiacs. It is called the Ayanamsha -- in Sanskrit ayana meaning solstice and amsha meaning portion -- and it refers to the difference between Tropical and Sidereal zodiacs. The zodiac is a ring of constellations often referred to as signs, such as Aquarius, Leo, Scorpio and Taurus. It is a cosmic clock around which our solar systems operates and how astrologers measure cycles of time. Most people do not realize that there are two distinct zodiacs. Vedic astrologers use the Sidereal zodiac and Western astrologers use the Tropical zodiac. The Sidereal zodiac is based on observations of planets lining up against the backdrop of the fixed stars. It is oriented to the center of the galaxy. On the other hand, the Tropical zodiac is based on the relationship between the sun and earth. It is oriented to the equinoxes. In Western astrology the spring equinox sets the beginning of the Tropical zodiac at 1 degree Aries, even though the sun is astronomically traveling in the light fields of Pisces. In other words, it does not correspond to observable position. Vedic astrology is called Jyotisha in Sanskrit, meaning the science of light, and Vedic astrology describes how the light emitted from the stars effects us. When Western astrology was in its early stages, the two zodiacs may have lined up; but over time the two moved apart approximately 50 seconds per year to the current 23 degrees of separation (even that number is debated, but the standard of India, the Lahiri ayanamsha is 23 degrees 10 seconds). 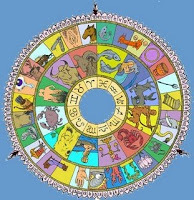 Vedic astrology is considered by scholars to pre-date Western astrology and is the only system that has accounted for the precession of the equinoxes. What is the precession of the equinoxes? The answer to that involves another occurrence of the number 23 (those familiar with the enigma of 23, like LOST and RAW fans, may find this amusing). Because Earth's axis is tilted 23° 27' in its orbit around the sun, its equatorial plane is tilted with respect to the ecliptic plane, the plane created by Earth's orbit. These two intersecting planes create an intersecting line called the vernal axis that occurs on the first day of spring, or Vernal equinox. As the Earth spins on its axis, its axis wobbles (precesses 50.3 seconds of arc per year or 1 degree every 71.6 years) very slowly over a period of about 24,000 to 26,000 years. As this occurs, the pole of the Earth inscribes an arc in the heavens called the precessional arc. The Earth's pole aligns with different stars throughout the precessional period. The current pole star is Polaris. Approximately 13,000 year ago it was Vega, one of my favorite stars. Earth's precessional cycle is also referred to as Earth's Great Year in the alchemical tradition, World Ages, or Yugas in the Vedas. David Frawley describes it a one year in the life of humanity. In Vedic astrology there is a line of thought that suggests this 24,000-26,000 cycle (and even wobble of the earth itself) maybe be generated by a grand cycle of our sun with a companion dark star. Modern astronomy is studying this possibility as well. The ancient Vedic seers divided up the cycle into four world ages: the Satya(Truth or Golden), Treta (Third or Silver), Dwapara (Third or Bronze) and Kali (first or Iron) Ages. Each age describes a stage of awareness for mankind in which consciousness ascends, descends, and ascends in unending cycles perhaps due to the influence of this yet to be discovered companion star. Although New Age philosophers have described humanity as entering the Age of Aquarius, astronomically speaking that will not happen for approximately 300-400 years. According to Vedic thought, the cycles of ascending and descending consciousness are connected not only to our rotation around a companion star, but also our cycle around the galactic center. According to David Frawley, "Vedic astrology orients the zodiac to the galactic center, or the central galactic sun, whose influence comes to us through fixed stars of the constellation Sagittarius." The galactic center is like our cosmic belly button -- it is sometimes called Vishnunabhi, or the navel of Vishnu-- the point from which our galaxy grew and expanded. Many ancient cultures studied and recorded their observations about this area of the night sky, including the Mayans whose calendar marks an astronomical event of our winter solstice aligning with the galactic center in 2012. It's like the earth's pole or antenna will be aligned and open to receive message from the source itself. [H]ohm is calling. One of the most brilliant developments of the ancient Vedic seers was to further divide the zodiac into more identifiable parts. They did this by creating the Nakshatra system. In Sanskrit Nakshatra means lunar mansion. As the moon travels through the entire zodiac in 27-28 days, the ancient seers ascribed a Nakshatra for each day simplifying its location. Although too vast a subject to go into in this post, it is interesting to point out that the name for the Nakstratra that marks the galactic center is Mula, meaning root or source. Another difference between Western and Vedic astrology is the modern use of non-observable planets and asteroids. As a Neo-Vedic astrologer I do consider some of the outer planets when I look at a chart, but I tend to be more interested in the fixed stars and Nakshatras. I marvel at how Western astrologers bring in new astronomical discoveries to their chart interpretations. Basically I see Western charts as a map of the same terrain as a Vedic chart, but indicating different types or levels of information. It's like comparing a topological map with a road map. I don't need to know the difference of elevation between Broadway and 3rd Avenue, but I might like to know the street number of Benaroya Hall. It all depends on what type of information one is seeking. Vedic astrologers come from a tradition and philosophy that focuses on the four aims of life: dharma (purpose), arthra (attainment), kama (desire),and the most important moksha (liberation). Western astrology is enriched by many diverse traditions and the information gleaned from it may be quite extensive and more suited for the modern mind. But for me, I've always been drawn to the stars in the night sky and have felt them speak to me in the language of light. And as Jyotisha is the science of light, it is the tool and filter I use to translate this information. For a good video overview on precession click here.